My holiday party had so much going on that I had to split the post into two. You were probably wondering what happened to dessert in my last post. Did I get so wrapped up in making the appetizers and putting together the wine tasting that I forgot about dessert? 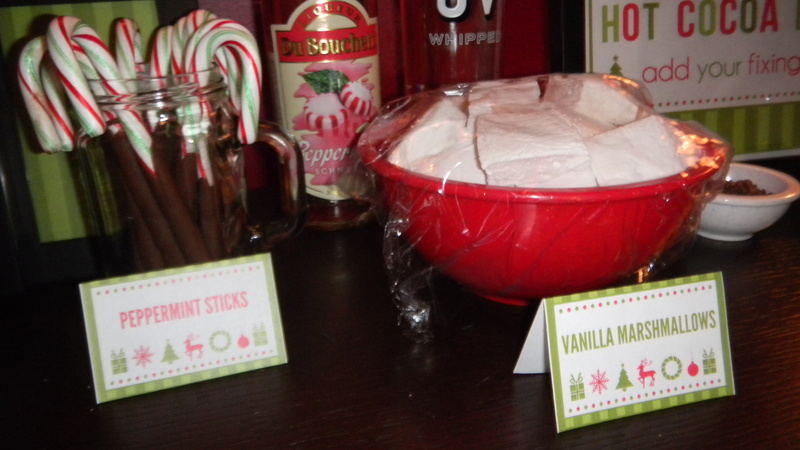 Instead of making one big dessert, I decided to make several little desserts as part of a hot cocoa bar. 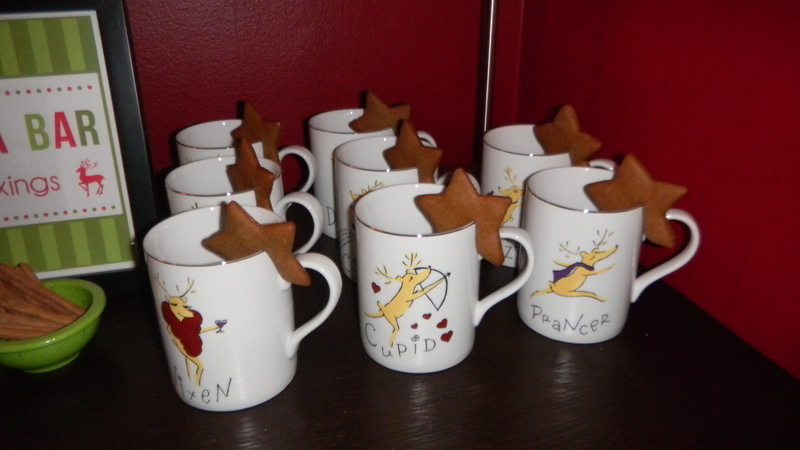 I always loved the idea of a hot coca bar and having a ton of different little mix ins to customize your hot chocolate. 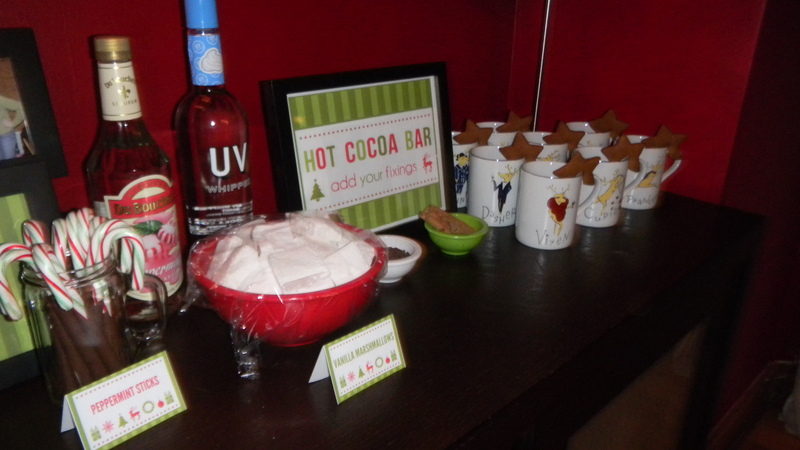 I think planning the hot cocoa bar was the part of party planning that I enjoyed the most. I planned to make some hot chocolate from scratch with real milk and cocoa powder (no mixes!) and have cookies, chocolate chips, candy canes, marshmallows, and some booze to let everyone have exactly the cup of hot cocoa they wanted. I pinterested and googled to see if I was missing anything. 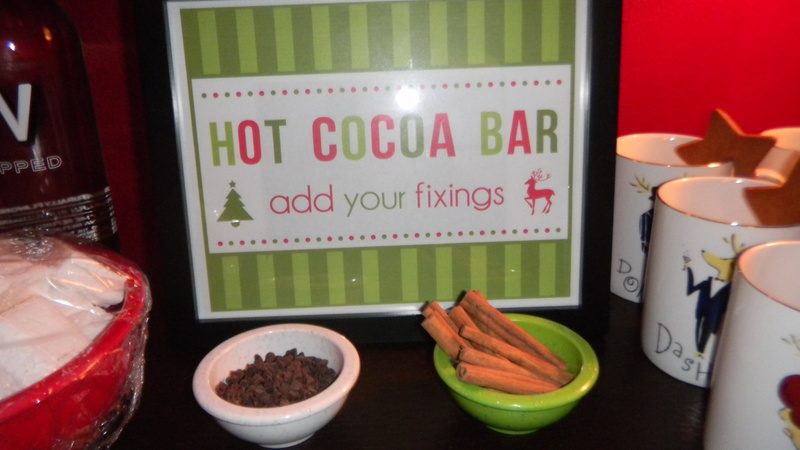 That’s when I came across this set of hot cocoa bar printables. I thought they were so cute, so I incorporated them into the decor. 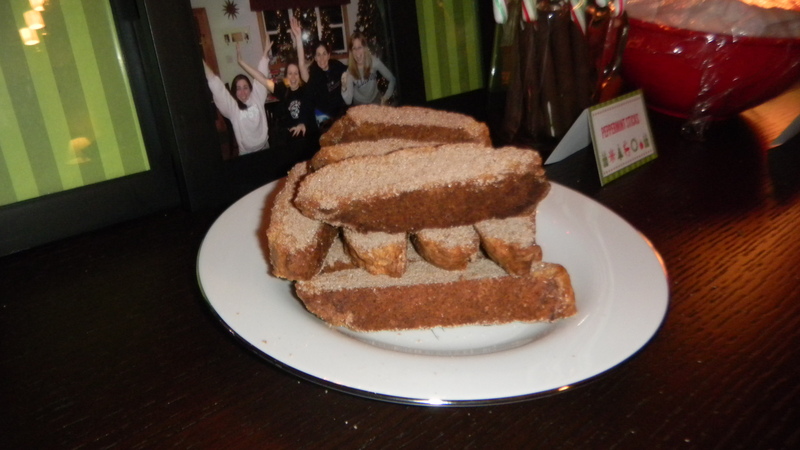 and gingerbread cookies. The thing about the cookies – I bought this great cookie cutter from World Market that cut cookies that were able to hang on the edge of the cocoa mugs. Aren’t they cute? Little hanging gingerbread stars. I also was crazy enough to attempt to make homemade honey vanilla marshmallows. The honey really comes out in the warm cocoa. I rounded out the bar with mini chocolate chips, cinnamon sticks, chocolate dipped candy canes, and frozen whipped cream dollops made at home from heavy whipping cream. For alcohol, I had some peppermint schnapps and whipped cream vodka on hand. I was so glad I put this hot chocolate bar together. People loved it and said it was a great addition to the party. Perhaps you can try one before this holiday season is over.